Rice and oat flakes I’M FIT with bananas is an easy way to prepare a delicious breakfast that complies with whatever dietary rules you may have adopted. The product is based on fully nutritious ingredients, provides a lot of dietary fibre and is enriched with proteins. Breakfast is commonly believed to be the most important meal of the day. It is of special importance for physically active people who care about their eating habits. Unfortunately, despite their best intentions, many people decide for mediocre breakfast because they lack the time needed to prepare something better. Flakes such as those produced by Activlab are a great solution to that problem. They contain two sources of complex carbohydrates that athletes value a lot, that is oat flakes and rice flakes; that type of carbohydrates are a great source of slowly released energy. Moreover, they can fill you for a long time thanks to the high content of dietary fibre. The addition of lyophilised bananas ensures a fantastic sweet taste and the portion of nutrients that the fruit contain. Moreover, taking into consideration the needs of physically active people, the flakes are additionally enriched with high-quality whey protein concentrate. It is the same type of proteins as the one used in popular supplements shortly referred to as WPC. They are characterised by great assimilability and a perfect amino acid profile, thanks to which they are metabolised well by the organism. They help to satisfy the increased demand for proteins that athletes experience by providing amino acids, which are an element of muscle tissue. The flakes are also characterised by a minimal amount of fat, thanks to which they have fewer calories. A meal based on them is light although it fills for a long time because of the content of dietary fibre. If you add the pleasant taste of bananas, it turns out to be a perfect solution for people for whom eating a proper breakfast is a problem. Moreover, the product has a low glycaemic profile and does not contain aspartame. A great advantage of the flakes is how easy they are to prepare. In order to get a fully nutritional breakfast that delights with its taste, you just need to add water or milk to it. Depending on how you like it, you can have it cold or warmYou do not have to add water to the product; you can also use it as a crunchy addition to yoghurt or other desserts. In order to highlight the sweet, fruity taste of flakes, you can serve them with sweet calorie-free sauces.. Preparing the flakes takes only a moment, so it is a perfect option for those who battle time every morning. What is more, the product is closed in the form of handy sachets, so you can easily take it with you and prepare it during a break at work or school. That way of packing the flakes guarantees their full freshness. 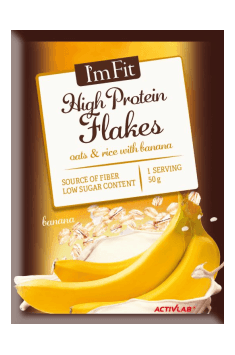 To sum up, rice and oat flakes with bananas of the I’M FIT line is a perfect solution for people who have limited time resources, as it allows you to prepare a quick meal with a fantastic taste and full nutritional value. The optimal balance of macrocomponents will satisfy all dietary needs, and the high content of dietary fibre will make the feeling of satiety after a meal stay with you for a good few hours. Pour the content of a sachet to a bowl and add 200 ml of water or milk. You can also prepare the dish using hot water. You do not have to add water to the product; you can also use it as a crunchy addition to yoghurt or other desserts. In order to highlight the sweet, fruity taste of flakes, you can serve them with sweet calorie-free sauces.